The deal paves the way for Tesla to offer an integrated solar roof plus energy storage product. In August, board members approved Tesla's bid to acquire SolarCity in an all-stock transition worth $2.6 billion. Today, Tesla’s shareholders "overwhelmingly approved" the purchase, which paves the way for the two companies to offer an integrated solar roof plus energy storage product. 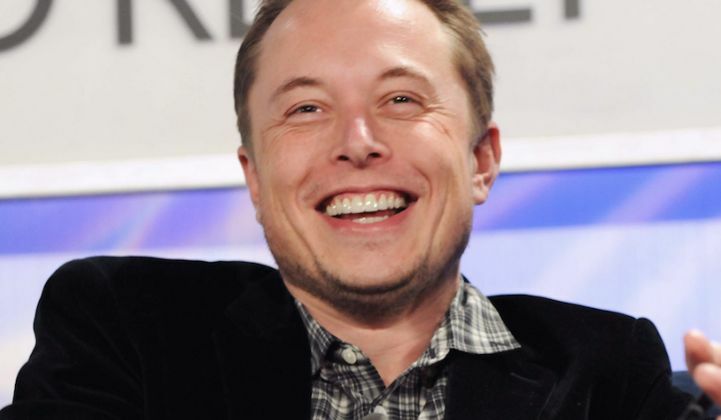 According to a just-published blog post, "Excluding the votes of [Elon Musk] and other affiliated shareholders, more than 85 percent of shares voted were cast in favor of the acquisition. With SolarCity’s shareholders also having approved the acquisition, the transaction will be completed in the coming days." Calling it a "conservative figure," Tesla aims to realize cost efficiencies of $150 million in the first year after closing the deal. Those savings will be driven by sales and marketing efficiencies, overhead savings and manufacturing efficiencies, according to the firm. "The acquisition of SolarCity will create the world’s only integrated sustainable energy company, from energy generation to storage to transportation," according to a Tesla blog post published ahead of the shareholder vote. By joining forces, the companies can offer a seamless home solar plus storage solution, featuring SolarCity and Tesla's new "beautiful" solar roof technology and the Powerwall 2.0. In a Q&A following the acquisition announcement, CEO Elon Musk said Tesla would start volume production of the solar roof next summer and that the product would sell at or below the cost of a regular roof -- including labor. "The electricity is just a bonus," he said. The merger also gives a green light to Tesla's new solar production partnership with Panasonic. Under the agreement, Panasonic would begin making PV solar cells and modules at SolarCity's $900 million solar plant in Buffalo, New York facility in mid-2017. Assuming the deal is finalized, it would give Tesla additional financial support for its ambitious business plans. SolarCity recently announced its Q3 financials -- trouncing consensus by $30 million on revenue of $200.5 million, thanks to higher-than-expected installation figures. Despite the revenue beat, the company just narrowly beat on EPS. SolarCity's leadership expects 2016 installations to be at 900 megawatts, the lower end of the previously guided range. It's the third installation guidance warning from SolarCity in 2016. It remains to be seen whether the newly approved acquisition will be a distraction for Tesla or a bailout for SolarCity. Musk said combining the two companies is the next logical step in his master plan. “The whole point of the merger is to get rid of the conflicts of interest,” he said, suggesting that consolidating into a single company is essential to moving his vision forward. Many investors and analysts have questioned what value SolarCity brings to Tesla, especially in the near term. High-profile investment manager Jim Chanos said the merger "makes no sense." He tweeted today, "I haven't seen a deal this good since Amtrak." But for some investors, increased diversification and lowered costs for an integrated company offer value in the long term. “Despite much near-term focus on SCTY, Autopilot, deliveries and demand, we find conversations with investors more focused on longer-term earnings potential,” wrote Baird Equity Research in a briefing. What Would Tesla’s Solar Strategy Look Like if It Bought SolarCity?